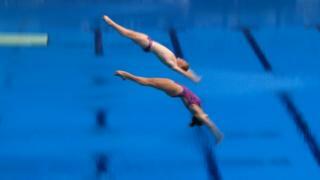 Great Britain's "superb" pair Grace Reid and James Heatly take the bronze medal in the Mixed 3m Synchro Springboard at the Diving World Series in London. The diving duo achieved a total score of 299.76 to finish on the podium behind Canada and winners China. Friday saw their team-mates Tonia Couch and Sarah Barrow, and Jack Laugher and Chris Mears also collect medals for Britain.